Runaway and homeless youth (RHY) experience high rates of trauma and abuse through the lifespan, but only minimal involvement in the settings and systems that typically protect youth such as school and family. This confluence of serious risk factors and absence of protective factors contributes to behavioral problems and poor outcomes among RHY. A network of specialized settings has developed to locate, engage, house, and treat RHY. Yet there is little research on which characteristics of these settings are the most effective, how settings can be improved, and what public policies are needed to support them. The project used a mixed methods approach and focused on settings that serve RHY in New York State. 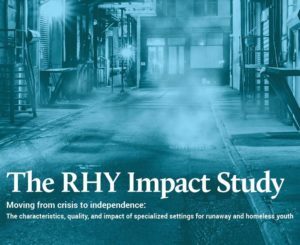 The sample was comprised of 29 settings randomly selected to reflect the types of settings that serve RHY across New York State, including urban, suburban, and rural regions. Within settings, the project conducted observations of setting practices using a validated instrument (The Youth Program Quality Assessment), semi-structured in-depth interviews with program administrators and staff, anonymous structured surveys with RHY (N=450), and focus groups with RHY at 10 randomly selected settings. The aims of the study were to: describe the diverse range of settings that serve RHY with respect to program quality; examine the impact of setting quality on RHYs’ outcomes in the domains of education/occupation, mental health, and substance use; explore factors that serve as facilitators of or barriers to settings’ effectiveness; elicit expert opinion on strategies to improve settings based on study findings; and disseminate findings nationally. The study findings will help inform policy and improve services for RHY. Gwadz M, Freeman R, Leonard NR, Kutnick A, Silverman E, Ritchie A, Bolas J, Cleland CM, Tabac L, Hirsch M, Powlovich J (2018). Child and Adolescent Social Work Journal [Epub 2018 Jul 16]. doi: 10.1007/s10560-018-0563-3. Gwadz M, Freeman RM, Kutnick AH, Silverman E, Ritchie AS, Cleland CM, Leonard NR, Srinagesh A, Powlovich J, Bolas J (2018). Frontiers in Public Health, 6, 112. doi: 10.3389/fpubh.2018.00112. PMCID: PMC5916963. Leonard NR, Freeman R, Ritchie AS, Gwadz MV, Tabac L, Dickson VV, Cleland CM, Bolas J, Hirsch M (2017). Child and Adolescent Social Work Journal, 34 (5), 443-459. doi: 10.1007/s10560-016-0483-z. Gwadz MV, Cleland CM, Leonard NR, Bolas J, Ritchie AS, Tabac L, Freeman R, Silverman E, Kutnick A, Dickson VV, Hirsch M, Powlovich J (2017). Children and Youth Services Review, 73, 398-410. doi: 10.1016/j.childyouth.2017.01.016. Coverage of findings by Noelle Leonard on key factors of successful programs for delivering services to runaway and homeless youth. The first part of a blog post on preliminary findings on programs and services available to homeless youth in New York State. The second part of a blog post on preliminary findings on programs and services available to homeless youth in New York State.